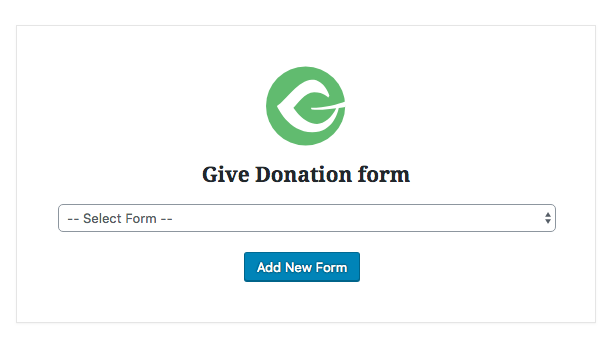 The Give Form Block provides an easy way to add a Give Form into a post or page using the new WordPress editor. Many of the form settings can be configured right from the block editor. 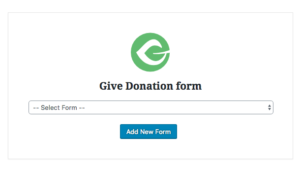 Start by doing a search for “Give Form” by either hitting the “+” or by typing “/”and selecting it from the options that display. Using the dropdown, select from one of the forms that have already been created or select “Add New Form” to be taken to the Form Editor. Once a form is selected, it will display within the block. When the form is hovered over, an option to either edit the current form or change to another form will display. Choosing to edit the form will redirect to the Form Editor for that form. Full Form shows all the fields on the page at once with the submit donation button at the bottom. Modal hides the payment fields until the donor clicks “Donate Now”. On click, all the necessary payment fields appear inside a modal window. Reveal hides the payment fields until the donor clicks on “Donate Now”. On click, all the payment fields scroll out down below the button. One button launch is like the “Modal” option, except that nothing is shown but a “Donate” button. On click the whole form appears in the Modal. If you wish to learn more about and see demos of the different display modes, check out our documentation here. This setting controls whether the form title displays on the page. The default setting is off. If already configured in the form editor, this settings displays the form’s goal on the page at the top of the form. Click here for more information on form goals. If form content has already been configured in the form editor, this setting will control whether that content displays. When toggled on, a dropdown will display for changing where the form content will show within the form. Click here for more information on form content. This is a default option for WordPress blocks that allow a user to pass a custom class so that it can be customized with CSS.